How do I watch hockey in Calgary? Hockey: Canada’s favourite pastime. We love cheering for our home team, screaming with excitement when a goal is scored, and eating nachos and popcorn in the stands. Going to a hockey game is a great social event to experience with your friends and family. 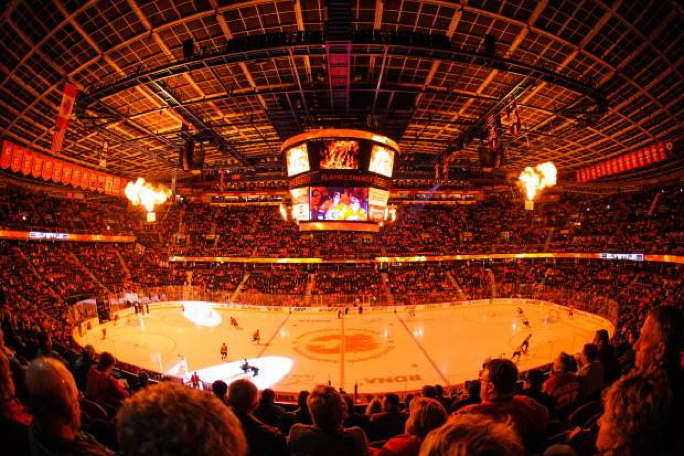 Check out a Calgary Flames or Hitmen game and experience a big part of Canadian culture! The Calgary Flames play in the National Hockey League (NHL), which is the highest level of hockey in North America. Teams from both Canada and the United States travel all over the continent to play against each other in hopes of being the best. The Calgary Flames began in 1980 when the Atlanta Flames relocated to Calgary. The new Calgarian team sold a record-breaking 755 standing-room season tickets to the Flames games at the Stampede Corral. The team had an amazing first decade, making it to the Stanley Cup Final game twice and winning the second time in 1989. The Stanley Cup is the trophy awarded to the winning NHL team of that season. In 1983, the Calgary Flames began playing in the new Saddledome arena, which is where they still play today. The Calgary Hitmen play in the Western Hockey League (WHL), which is the junior professional hockey league in North America. The Hitmen were purchased by the Flames in 1995. Both the Flames and the Hitmen are owned by the Calgary Sports and Entertainment Corporation (CSEC), along with a few other local sports teams. The Hitmen have a large fanbase, averaging 10,000 fans per game. As a junior team, many players for the Calgary Hitmen graduate to play in the NHL. So far, there have been 55 players drafted to the NHL from the Hitmen, 10 of whom were chosen in the first round of the draft. The Calgary Hitmen are also always finding ways to contribute to the community. The Calgary Hitmen Foundation has put over 2.5 million dollars into community programs. There are a few ways to purchase tickets to see the Flames or Hitmen play. The easiest way is to purchase them online. You can also purchase tickets from others who have previously bought tickets but are re-selling them. However, buying tickets this way is not always safe. To avoid a scam, using the above links is the safest method for getting to the game. If you would rather purchase your tickets in-person, you can visit any Calgary Co-op grocery store. Buying tickets from Co-op limits your seat choices to press level or the green section (both far away from the ice); check the seating map here: https://www.nhl.com/flames/tickets/coop-zone. You also have the advantage of saving up to 40% on your Flames tickets by purchasing them from Co-op. Co-op also has a monthly draw for its members from which you can win game tickets. If you aren’t already a Co-op member, you can go here to purchase your membership for only $1: https://www.calgarycoop.com/online-membership/. To enter the draw, you must fill out the application by the 10th of every month. You can find more information about the draw and ticket prices here: https://www.calgarycoop.com/events-tickets/tickets/. Parking at the Saddledome can be expensive, costing about $15 dollars per vehicle. Other parking lots within walking distance to the Saddledome are also an option but usually charge around $20 per vehicle. Alternatively, the Saddledome is located conveniently near the Stampede and Erlton LRT stations. Take the C-train right downtown and walk a few minutes to the stadium from either station. It will be easy to remember your stop – the train will be filled with people wearing Flames jerseys! Possibly one of the most anticipated sporting events of the year in Calgary is The Brick Teddy Bear Toss put on by the Calgary Hitmen. Fans bring teddy bears to the hockey game, which later are all thrown onto the ice at the same time. These teddy bears are all donated to local charities and delivered to children at the Alberta Children’s Hospital by the Hitmen players. The Teddy Bear Toss is a fun activity to enjoy with the family. Kids have a wonderful time throwing the bears down the stands and seeing how many thousands pile up in just a few minutes. There have been over 320,000 teddy bears donated to date. Club Flames and Club Hitmen provide free access to contests, information about family-related events, and discounted tickets. If you’re interested in registering for the e-mail list to gain access to this information, you can find the two clubs here: Club Flames and Club Hitmen.